In the U.S. and elsewhere, bicycle programs are being designed to help fight obesity, improve traffic conditions and reduce the cost of transportation. In underdeveloped countries bicycles fight poverty by expanding people's reach and saving time. 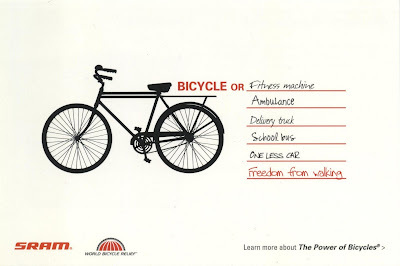 To learn more about how bicycles change our world, go to SRAM Cycling Advocacy Fund and World Bicycle Relief.